Bring a cup of water to a boil; sitr in couscous and cover. Let stand 5 minutes then fluff with fork. Cut the eggplant in half, down the center, and scoop out the center, leaving enough meat inside the skin so that it holds its shape when baked (1/2-inch lip). Trim a bit of the bottom so it sits straight. Chop eggplant pulp and reserve. In a large sauté pan, heat 1 1/2 tablespoons olive oil over medium heat. Sauté onion 3 minutes, add tomato paste and sauté an additional minute. Add chopped eggplant and sauté 3 additional minutes or until eggplant is tender. Stir in cooked couscous and olives. Lightly season mixture with freshly ground pepper. Let cool slightly, then stir in pine nuts and feta. In a bowl mix together the panko and remaining tablespoon olive oil. Brush interior and lip of eggplant shell with olive oil. Fill the scooped-out eggplant halves with this mixture, dividing it evenly among the 2 halves. Place on an oiled cooking sheet or baking dish, lightly tent with foil and bake for 15 minutes on middle rack of oven. 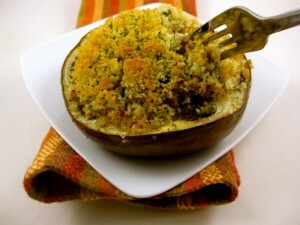 Remove foil and bake and additional 25 minutes or until eggplant is tender.